This year we decided that there were too many traditional St. Patrick's Day dishes that we wanted to make and they couldn't all be contained in just one day. We knew that in order to enjoy all of these foods we would have to get started early. When I say traditional I am, of course, referring to tradition in the United States. I don't know anything about authentic Irish cooking. I'm pretty sure it involves a lot of potatoes. Other than that I'm shamefully ignorant of what goes on on that island. Ireland is an island, right? Yesterday we had a few folks over and Jen fulfilled her normal role in doing all the baking and dessert making for the get together. 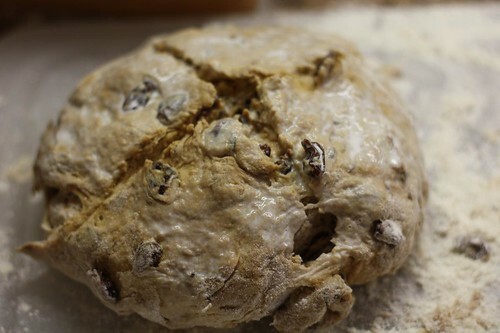 This is her formed soda bread before she popped it into the oven. Sadly I was not clever enough to get a picture of it after it was baked. I was also not bright enough to get a picture of the Seaside Cheddar, Cotswald (not Irish, I know), or the Cashel Blue. Just imagine, if you will, some fantastic-looking soda bread (two varieties) cheeses, and a plate full of Kerrygold butter. Can you picture it? There. Isn't it spectacular? 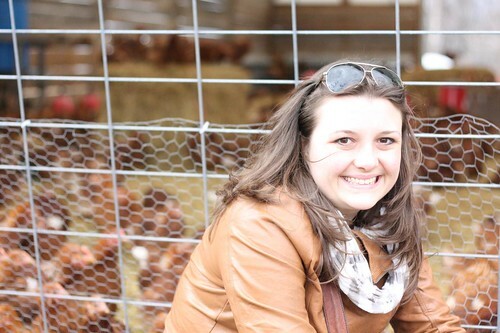 Today, we spent the day at Stone Barns making no purchases and annoying farm animals as I tried to work on my skills utilizing the aperture setting thanks to the long-awaited Mostly Photo show. I'd say now my photography skills have increased to 13 (out of a possible 1,000). Tonight we feasted on leftovers from last night's kick off to National (American) Irish Week 2011*! 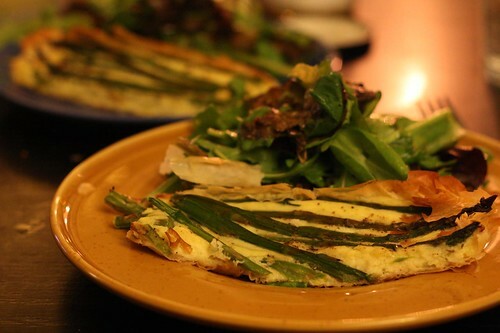 I made this asparagus potato tart with filo dough. It was based on a recipe by Jamie Oliver. Basically I brushed 5-layers of filo with butter and put them on a cookie sheet. Then I boiled some potatoes, mashed them together with some shredded Tipperary cheddar, eggs, nutmeg, cream, salt, and pepper. I put the mashed potato mixed and topped with some lightly steamed asparagus, topped with olive oil and baked in the oven. Since it was based on Jamie Oliver's recipe it turned out like proper bloke's right proper quiche. Best mates. I served it with some mixed greens tossed in lemon, olive oil, salt, and pepper. Jen thought there was too much lemon. I thought it was a nice compliment to the asparagus. I find it unusual that someone who has never had a drink of water that she did not squeeze some sort of citrus into is so sensitive to the same juice in her salads. The main course was boiled corned beef, cabbage, onion, potato, carrot, and Irish bangers. 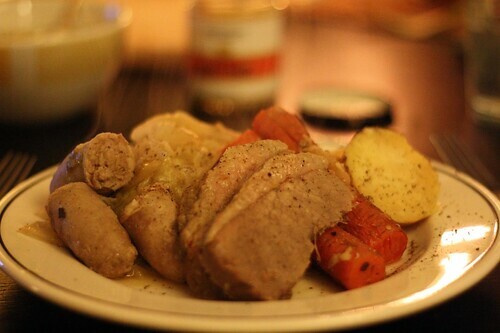 I added bangers to the mix last year and I don't think I'm ever reverting to bangerless boiled dinner again. They are a fantastic addition. 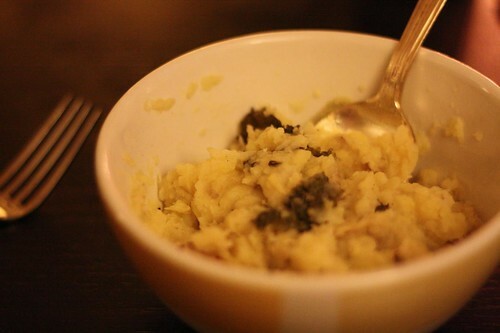 I also made a variation on colcannon but very simple and vegetarian. Essentially it was just mashed potatoes with cabbage, olive oil, and a lot of butter, salt, and pepper. I also put in some of the remaining kale in the fridge toward the end of the cooking to give it a little color. 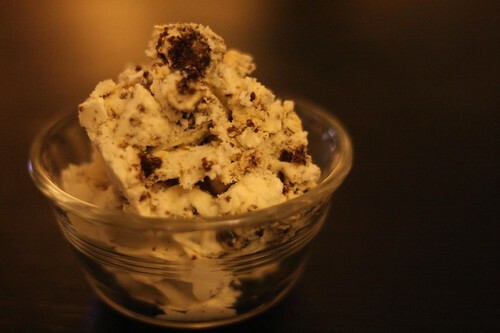 Jen made this fantastic ice cream with some leftover brown bread from the freezer. She crumbled it up, baked it in the oven with some sugar, then made a basic custard, chilled it, and folded it into some whipped cream. She added some whiskey to the whipped cream and then crumbled up the brown bread to add it to the ice cream. It didn't require the use of an ice cream maker and came out really good. I think we will be using this technique again soon. There were also several failed attempts to make black and tans throughout the evening. I think I'm going to use the rest of the week trying to make one properly. Given my lack of enthusiasm for the beverage this should be interesting. I don't expect much success. I'm wiping the ice cream off of mine! Lacking on Theme, Heavy on FUN! Fajita, Are We There Yet?